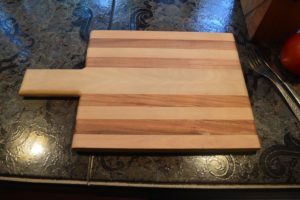 The work surface of this kitchen cutting board ( butcher block) is End Gain, which makes it very resistant to scratches from the knife and preserves the sharpness of the knife much longer than other kinds of boards. The blade slide between the wood fibers. 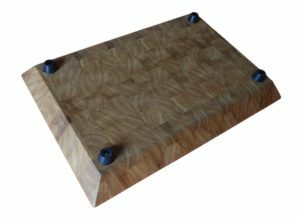 After two years of prototyping, research and testing various shapes, sizes and materials with joy we can introduce this wooden board fruit of a lot of effort and reflection. 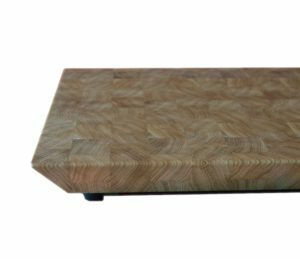 Pattern is selected so, that it opposes the tension in the wood, and it enables to keep extremely flat work surface ( allow speed cutting). Made of high quality oak timber. Oak wood has a high grade of moisture resistance and durability. 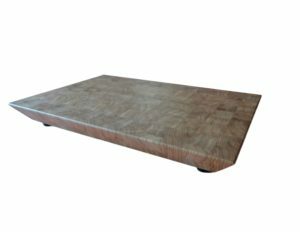 Natural wood is antiseptic (antibacterial) and is a better choice than plastic boards (this is scientifically proven that the wooden boards are more hygienic and safe for the health of plastic). Each piece of wood has its original and unique texture end grain, so each board has its own unique look. Lateral sides are 35 degrees and this is incredibly useful. 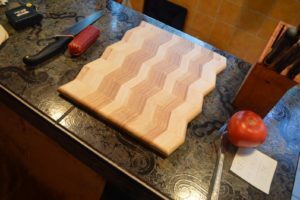 If you use often this cutting board you will appreciate this angle. It helps in collecting chopped products and clearing up afterwards. The size of the working surface is 30 x 40 cm by 4 cm thick. 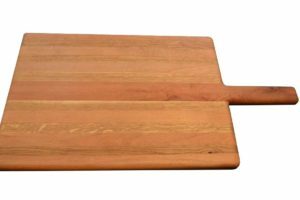 The board is large enough for a major kitchen board. There is stable rubber feet to prevent slipping and dries faster. Large and heavy boards like this do not wash the sink so rubber feet allow the board to breathe and dry easily, not to collect moisture on the underside. 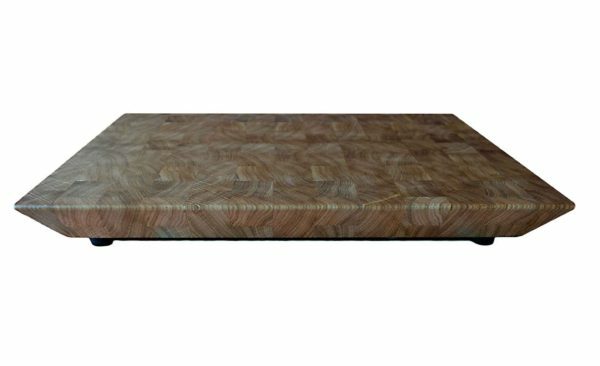 This butcher block was 3 times impregnated with mineral oil in 24 hours + 2 times with a mixture of mineral oil and beeswax. If you maintain surface coating, it will be saved as a new and unscathed many years. Glued professional with special technology with one of the best waterproof and food safe. Titebond III. The stylish design and superior functionality will bring comfort and luxury in every kitchen. A Bulgarian product that will impress you.